I can’t quite believe that more than ten whole years has passed since Mr Tin Box and I took a four-week European road trip as a couple. I had just made a career leap from journalism to public relations and Mr TB was about to embark on a life in the Royal Navy. It was a now or never moment. Plus we were in our mid-20s and not afraid of spending most of our adventure under canvas. Oh, how times have changed. Exactly a decade later we are both well established in our careers and have the responsibility of a dog and two daughters shaping our travels. When we set out on our European adventure in July 2006 we had booked our ferry from Dover to Dunkirk and just one campsite – our first stop in Belgium. From there we had only a vague plan of our route through Luxembourg, Germany, France, Spain and then back to the UK. It was an epic trip from which I have so many amazing memories: seeing iconic sights in Belgium, appreciating the history of Luxembourg, chilling out in German beer gardens, canoeing down the Ardeche in France, and appreciating art in Barcelona. But I also remember it being hard work at times. Some days we were exhausted, arriving in unfamiliar towns with no idea where the closest campsite would be or whether our meagre savings would last. That said, it’s a road trip Mr TB and I have said we’d love to do again. Today, with two kids and a dog in tow, we know we’d have to be a bit more organised. Driving for hundreds of miles without a specific destination in mind and finding accommodation last minute are no longer options. The ten year anniversary of our European road trip got me thinking: how would we make it family-friendly? It would be amazing to visit some of the same destinations along the way, as well as a few new ones. And of course we would probably spend a little less of our trip appreciating the night life and more time taking in the family-friendly side of Europe. 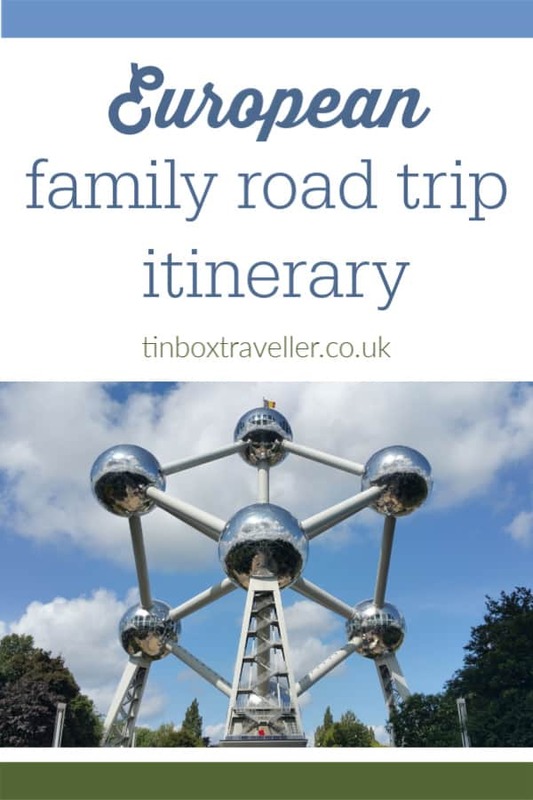 Apart from the obvious differences between holidaying with and without children, there’s a few other things that would change our next European road trip. In the past ten years we’d put our tent into retirement and bought a caravan. While I still love the idea of ‘real’ camping, the benefits of not having to erect your living quarters cannot be underestimated. We can quickly get undercover and feed hungry mouths using the fully equipped kitchen within minutes of pitching up. We also have plenty of storage for food. Ten years ago we kept chilled food edible using a small cool box and ice blocks. Trips to the supermarket were almost daily. Tin Box Dog accompanies us on as many holidays as possible, but is yet to have her Pet Passport stamped in Europe. We love the idea of taking her with us and, while staying in our own caravan, finding dog-friendly accommodation is rarely an issue. She is microchipped so we would just need to make sure she is up to date with her vaccinations and checked out by a vet before we travel. This is the first time I have attempted to plan a European road trip. Better late than never I suppose! Taking into consideration we are now a family of four I have allowed at least two days in each place we want to visit, sometimes more, and no longer than four hours on the road between each destination (assuming ideal traffic conditions). Ten years ago we decided to take the shortest ferry crossing we could and travelled from Dover to Dunkirk. This was cheap and meant we could start our adventure as soon as possible. What we hadn’t bargained for was that this meant a rushed return drive back through France to get home in time for our work commitments. Today we would do our trip in reverse, starting in Spain by taking the Brittany Ferry crossing from Plymouth to Santander. In just 20 hours we could cover the same distance as in four days of solid driving with a caravan on back – not an option with two pre-schoolers. The North coast of Spain is an area we haven’t visited. The Cantabria region near Santander, with its medieval villages and beautiful coastline, would be the ideal spot to begin our road trip. We never made it to Madrid during our first European road trip so this would be a bonus stop off for us on our family road trip. As well as visiting Spain’s capital from one of the numerous commercial campsites close by, it would be wonderful to see some of the Sierra de Guadarrama National Park, which is said to be a beautiful spot for hiking. This is another city we missed last time round. It’s an ideal place for some family beach days as it would be out first stop on the Mediterranean coast. 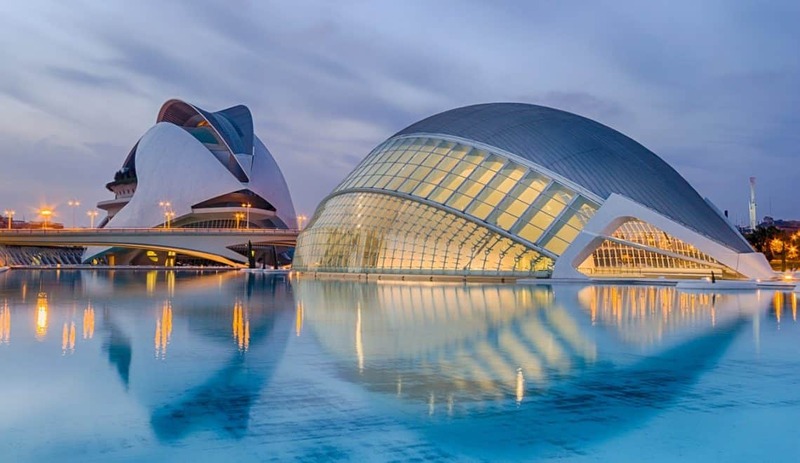 Valencia also has a range of animal parks to keep families entertained, from the 100,000 sqm Biopic conservation zoo to Oceanographic – the largest aquarium in Europe. The capital of Catalonia was the furthest south we travelled in 2006. We spent a wonderful few nights staying with friends in the Gothic Quarter of the city centre. More recently we visited with our girls before joining a cruise. It’s surprising what you can see when you have just 48 hours in Barcelona. I’ve been back to the region since to explore more of Costa Barcelona – highly recommended for families. We love this city, but with a caravan we would obviously have to stay on the outskirts. 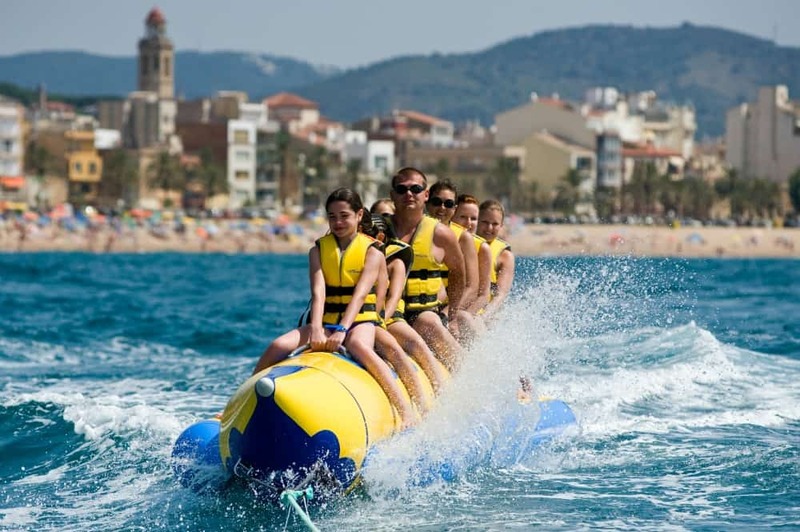 On the upside, we would have more opportunity to explore the Costa Barcelona region and towns like Calella where there are family-friendly holiday resorts offering water sports and children’s activities as well as access to the region’s three national parks in the Catalonian coastal mountains. 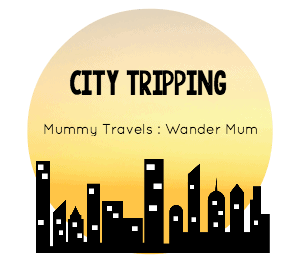 I travelled to the region in 2018 and can highly recommend it for families. Here’s where I’d explore more in Costa Barcelona. Back on our original route, we stopped north of Nimes at a campsite within a few miles of Pont du Gard. This aqueduct was built in about 50AD and stands as an impressive monument to both the awesomeness and the functionality of Roman architecture. I’d love to revisit this place with our girls and spend time swimming in the river with this as our backdrop. A short drive north is the Ardeche – another highlight of our original road trip. Here we hired a canoe and paddled 8km down the gorge from the Vallon-Pont-d’Arc; admiring the limestone cliffs and stopping at secluded beaches along the way. We also visited Aven d’ Orgnac – one of several world class caves in the area. It would be brilliant to do both again with our girls. Dijon was a rather luxurious stop for us during our last European road trip as we had lodgings at a farm house owned by one of Mr Tin Box’s cousins. We loved the countryside and the traditional French towns to the south of Dijon but it would be fantastic to see a bit of this centrally located city as well. Our girls are used to visiting museums and according to the Go Nomad travel blog kids will love the exhibits at the Natural History Museum. This sounds right up our street, as does walking around the old town to admire the Capetian, Gothic and Renaissance architecture. Another area that has me tempted to detour is The Dordogne and its wonderful reasons to visit. Seeing the chateaus, rustic towns and pre-historic cave art would be wonderful to incorporate into a European road trip. We timed our 2006 stop off in Freiburg to perfection, hitting the city in the middle of a festival that filled the streets with revellers, beer tents and music. However, our main purpose for visiting the Black Forest region, and why I’d like to go again, was to see the countryside. During our stay we took a ride on the Schauinslandbahn cable car up one of the area’s 70 peaks – Schauinsland. We also visited the Schauinsland Mine where silver, zinc and lead were dug up for 800 years. My most enduring memory from St Goar was camping right on the bank of The Rhine with barges, small cruise ships and pleasure boats sailing past throughout the day and night. It was compulsive watching from our tent door. Our campsite was overlooked by ruins of Rheinfels Castle and we were just down river from the Lorelei Rock. It was a fantastic place to stop and watch the world go by. If we returned I’d like to take a tour of Rheinfels – the most imposing castle on the river – and of course, enjoy a river boat cruise. Last time we visited Luxembourg was after a packed few days in Belgium, right at the beginning of our first European road trip. I remember the urge to relax was fierce and in the end we just sauntered around there city, popping into the odd bar and taking in the atmosphere, as well as local pastries. We also stumbled across the Bock Casemates – our one proper piece of sightseeing. With children to entertain we will have to be much more organised next time. To the west of the city there’s an old-fashioned steam railway that I know our girls would enjoy, while in the south there is the Parc Merveilleux leisure and fairy park. Perfect family fun! Brussels was the first stop off during our 2006 European road trip and we walked our socks off. We saw a lot of the sights: Grand-Place, Les Galeries Royales Saint-Hubert, the Royal Museum of the Armed Forces and of Military History, the Atomium, Parc de Bruxelles. And what trip to Brussels would be complete without admiring the Manneken Pis – the weeing boy? I’d do it all again in a heartbeat with my girls. The city of love was the final destination our original tour of western Europe. After a month under canvas we treated ourselves to three nights in a hotel just off the Champs-Élysées. We squeezed in visits to the Eiffel Tower, Notre Dame, Foucault’s pendulum at the Pantheon, the Moulin Rogue and the Louvre. It would be brilliant to revisit some of these places with our children (maybe not the Moulin Rogue – too many questions! ), although I don’t expect we could fit half of it in as sightseeing with kids always takes longer. Depending on when we visit Paris there might also be requests to see a certain Mouse on the outskirts of the city. However, it’s something I’m willing to put off for another few years if we can. If you’ve got your sights on a kid-free visit to Paris then I have some ideas for you. Check out some more ideas for visiting France with kids. All good things must come to an end and after completing our original itinerary in reverse there would be a relatively short drive and ferry ride back to the UK from Cherbourg to Poole. I’d love to hear if you have done a European road trip with kids. How was it for you and, if you visited any of the destinations on our perfect family itinerary, please share your recommendations. Disclosure: the photos from our original European road trip were lost in a hard drive accident, so the photos in this post are courtesy of Pixabay, with the exception of the Barcelona picture which has been kindly supplied by Calella Tourism office. I dream of taking a European road trip too but the lack of money, time and a decent car play havoc with plans! I have a couple of semi planned trips, one around Scandinavia and the other around Spain and Italy too. One day….. PS This might be a duplicate comment, not sure if my original one made it! Money and time would be the big issues for us as well. We have some saving to do before we can embark on this adventure! I’d love to squeeze in Italy but I think that would be one country and several hundred miles too far within a month. Thanks for the tip Sam! You are really spoilt for choice with natural wonders in that region of France and we love caves! This sounds like such an amazing trip – I did a similar camping trip round Europe when I was 20 (with train rather than car) although my scheduling was a bit more obsessive. I love the idea of a big road trip… although if I can persuade my husband to drive so much the better. Time to save. We’ve been to a few of these spots too and my brother is planning to take a year out next year with his 10 & 8 year old in s camper van and do a similar route to you. Valencia is soooo child friendly-we went a few years ago and there is so much to do with kids, and like you say-on the beach too. Such a beautiful city. I’d love to do northern Spain one day too! We’re taking kids to Madrid in 3 weeks! Uber excited!! Alex recently posted…Tea and Tittle-tattle on the Cromford Canal – A Fun Family Day Out. Wow! I”m very jealous of your trip to Madrid. Have a great time. I hope we’ll get there one day soon! It really was the most amazing phone call when I got it. I’m still pinching myself over a month after doing it!! Cruising an road trips are very different ways of seeing the world but I have a very big soft spot for both! Thanks Vlad. Me too! I think we have a bit of saving to do beforehand, but we’d really like to make it happen. Those itchy feet need to be satisfied! What an amazing trip, you are lucky to get so much time off in a block we have to make do with two weeks, but lots of ideas for holidays! Thanks! It’s something we hope we can do sometime soon. Not yet 🙂 We didn’t have a dog the first time, so the next time with a per would be a new experience for us! Yes, it would just be a little far to fit in Austria as well. Good luck planning your own adventure! Emma recently posted…Toddler Tablet Fun! KidloLand App Review! I’d love to do it again right now, but I agree that when the girls are a bit older might be better. We’d just have the school holidays to work around. Brilliant! I can’t wait to hear about your road trip. Great route for your road trip. Put in my vote for you, Claire. Hope you win the competition! Thank you so much, I really appreciate that! We’re in the same boat regarding school. Now, or next summer, is possibly the time! Was just searching for advice on family road trips and found your post – so helpful and inspiring. Thank you! Do you think the route you suggested could be done in 5 weeks? Hi Victoria, I’m glad you liked it. I do think you could do it in five weeks, especially if you weren’t towing a caravan like we would intend to. It’s one of those routes that you could do as fast or slow as you like, but four weeks would be the absolute minimum. Hope that helps. Oh this is an excellent route! Some well known and lesser known places combined. Both Freiburg and Luxembourg City are indeed lovely, and great fun for kids. I am always so sad not more people know this! Our (first) little one is due in June, so no road trip just yet. But **maybe** a short trip in September? Who knows, fingers crossed.